Tasted blind at the annual “Burgfest” tasting in Bouilland. The 2013 Meursault 1er Cru Charmes du Dessus demanded coaxing from the glass, eventually revealing attractive notes of dried lemon peel, lanolin and a tang of marmalade. The palate is well balanced with a crisp line of acidity. Lime and lemon at first, soon joined by orange peel and walnut. There is moderate weight in the mouth and a generous dash of spice washing over the finish. 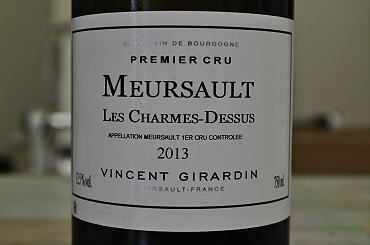 This is a very decent Meursault from Girardin. Tasted May 2016.